The Newfoundland law of real property was a modified variant of English law. The island's criminal law closely	followed English jurisprudence. Newfoundland had no legislature in which to pass bills or to debate policy. In the wake of the appointment of a governor and magistrates in 1729, the reception of English law became a contentious issue. In response to jurisdictional disputes between the justices of the peace and the fishing admirals, the Solicitor General was asked to provide a legal opinion. He concluded: "I apprehend that all the statute laws made here previous to his Majesty's subjects settling in Newfoundland are in force there, it being a settlement in an infidel country. But as to the laws passed here subsequent to the settlement," he continued, "I take it they will not extend to this country unless it is particularly mentioned" (quoted in Bannister 1999 114). In theory, the date of settlement appears to have been the watershed in the reception of statutory law. In practice, however, magistrates continued to draw on whatever statutes and writs they deemed necessary to execute their commissions. As Christopher English has pointed out, the grant of representative government in 1832 marked when imperial statutes ceased to be ex proprio vigore in force in Newfoundland (English 1996 71). The problem of delineating the actual reception of English law breaks down into the law of master and servant along with property law, on the one hand, and criminal law on the other. In the former case, the reception of law was relatively clear. Prior to 1775, the law of master and servant derived from English law, local customs (e.g. the law of wages and lien, which had been promulgated in 1749), and the statutes respecting vagrancy and disorderly persons, which magistrates used as authority for ordering corporal punishment for unruly servants. Engraving by H. Allard, designed by William Hogarth (1697-1764), c. 1735, and entitled "The Idle Prentice Turn'd Away and Sent to Sea." From J. Trusler, E. F. Roberts, and James Hannay, eds., The Complete Works of William Hogarth (London: London Printing and Pub. Co., 18--) 58. In 1775 Palliser's Act conferred a statutory law of master and servant specifically designed for the Newfoundland fishery. The regulations governing master-servant disputes were the most explicitly established aspect of the island's pre-1792 constitution. Given the fishery's reliance on wage labour—and the concern repeatedly expressed by merchants over the need to control servants—this is hardly surprising. The Newfoundland law of real property was a modified variant of English law. In 1793 Chief Justice Reeves argued persuasively that three types of title governed the island's law of property: grant, occupancy, and statutory prerogative. On the law of grants, Reeves asserted that they were issued by the governor or a surrogate. The second form of property holding, occupancy, conformed entirely to English law. According to Reeves, three-quarters of the land held in Newfoundland was by simple occupancy, with no written grant whatsoever. The third type of title derived from the statutes governing the fishery. Both King William's Act (1699) and Palliser's Act (1775) regulated the possession of real property. The fundamental principle was that rights were contingent upon use: title to land lapsed when property ceased to be held in support of a fishing operation. Statute law reflected imperial policy: in theory, Newfoundland was merely a fishing station where all forms of property were devoted solely to the prosecution of the English migratory fishing. In practice, local courts invariably dealt with a wide array of property cases. Archibald Buchanan, a customs officer in Newfoundland and legal advisor, captured the essential point: "The property in land, thus established, may be conveyed to heirs, may be devised by will, may be disposed of by sale, may be let to tenants, may be adjudged to creditors in payment of debt—but it must, in all cases be employed, as the Act directs, in the business of the fishery" (Buchanan 381). The stipulation that real property must be held in conjunction with the fishery—and must not interfere with fishing operations—was neither completely nor consistently upheld. Governors periodically enforced the statutory restrictions to the letter of the law. In 1779 Governor Richard Edwards directed the civil magistrates to make a complete report of the houses in St. John's and to ensure that no new buildings were constructed without his permission. Edwards then ordered the high sheriff and the justices of the peace to arrange for the demolition of four houses deemed a nuisance to the migratory fishery. Seven years later, in another wave of administrative initiative, Governor John Elliot published a proclamation forbidding new buildings to be erected below the Upper Path (what is now Duckworth Street), without written authorization. In 1787 Governor Elliot ordered the high sheriff to inspect buildings before allowing any renovations to proceed. Yet the actual enforcement of the restrictions on real property can be easily overestimated. No more than 20 dwellings were ever destroyed by order of the governor: most residents of St. John's enjoyed their property in peace, regardless of its connection to the fishery; and those living in the outports faced even less regulation, leaving the common law preeminent. In effect, settlers enjoyed the right of possession vaut titre; except in special cases where the courts found a property to be a nuisance to the fishery. A detail of St. John's showing the upper path area from a painting entitled "View of the Upper end of the Harbour from a little below Fort William." Artist unknown. Courtesy of the National Archives of Canada (NAC: C-3372). with more information (55 kb). Evidence suggests that the island's criminal law closely followed English jurisprudence. There were four basic sources of local law: King William's Act; the governor's commission; the instructions authorizing the governor to constitute a court of oyer and terminer; and the commission of the peace. King William's Act specified no punishments for transgressing its provisions. The governor's instructions and commission provided some basic regulations—e.g. no officer of a trading ship could be executed on the orders of the island's assize court—but contained little substantive law. And the commission of the peace actually conferred less authority than that given to English magistrates, since the Newfoundland justices had to work within the parameters of the 1699 Act. The assize bench was left, therefore, to follow whatever laws they deemed compatible with their commission of oyer and terminer, which stipulated only that they follow "Law and Justice." This presumably referred to English law, and trial proceedings indicate that the judges were indeed following English practices. But to what degree magistrates felt bound by statutory law is entirely unknown. For example, no reference was ever made at the Newfoundland assizes to benefit of clergy, —no trial transcript records its invocation—but a number of offenders were branded for offenses, such as manslaughter, in a manner that suggests that they had been granted clergy. Taken together, the evidence indicates that English criminal law, in toto, was the law enforced throughout Newfoundland's courts. Overshadowing the reception of law was the fact that Newfoundland had no legislature in which to pass bills or to debate policy. Without an elected assembly or even a town corporation, the process of making local law fell to the governor and the judiciary. 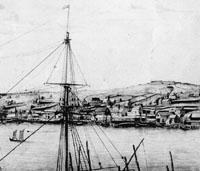 Measures that worked and caused the fewest problems were adopted; the task of reshaping English law through colonial legislation, which occupied a salient feature of politics in most British colonies, did not apply to Newfoundland until after 1832. The question of reception is interesting, then, not because it was contested, but because it received virtually no public comment prior to the 19th century. Without an independent press to monitor the judiciary, the island's courts interpreted the varying sources of law according to local imperatives.